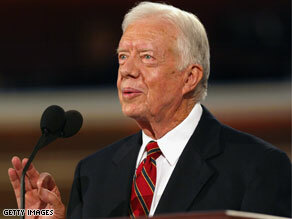 Jimmy Carter, a superdelegate, has endorsed Obama . (CNN) - Former President Jimmy Carter, in a widely expected move, will endorse Barack Obama's presidential bid later Tuesday or early Wednesday. He also said that Clinton “had a perfect right” to keep running – but that “a lot of the superdelegates will make a decision quite, announced quite rapidly, after the final primary on June 3." Nunn, the former Georgia senator, is known for his foreign policy and national security expertise. The worst president we've ever had endorses Obama. Wow. Whoda thunk it? Wow, I could have sworn I heard Bush endorse McCain? Hillary as VP????? NOOOOOOOOOOOOOOOOOOOOOOOO !!! Anyone here remember Spiro Agnew ??? Having liars and crooks in the White House, even as VPs, will tarnish our "new beginning". And the nation will be absorbed with Bill's latest scandals instead of focusing on fixing what's wrong.......Hillary for Gov of Puerto Rico !!! Those of you who keep saying McCain = Bush 3rd term. You are showing your ignorance. Do some homework on the candidates! Thank goodness I know where Jimmy Carter stands. This just solidifies McCain as the best candidate.